In the Virginia countryside, love ofanimals permeates the lifestyle. It goes beyond dogs and horses. 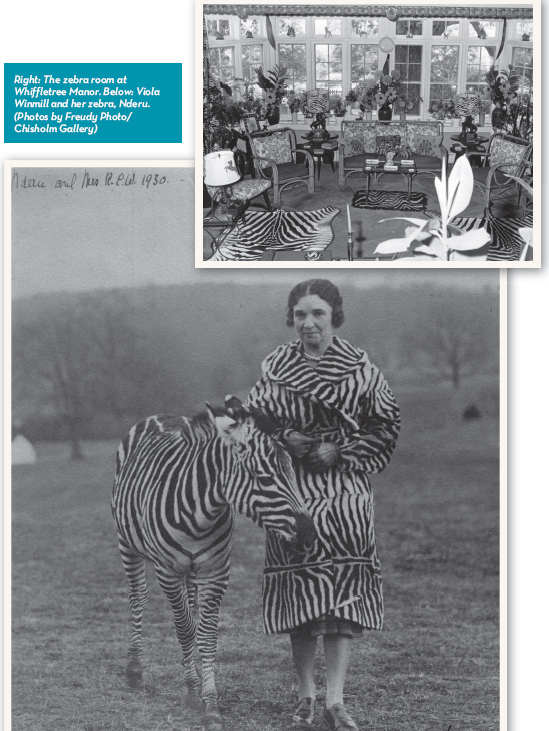 Consider the late sportswoman Viola Townsend Winmill, whose zebra, Nderu, was imported in June 1930 from Kenya and trained to pull a cart. Mrs. Winmill even added a sunroom on the back of a tenant house known as Whiffletree Manor at her 350-acre farm, Clovelly. The “Zebra Room” paid homage to Nderu’s distinctive black and white stripes in everything from lamps to rugs. Winmill sported a coordinating fur coat long before it became politically incorrect. Today, we have many more animal lovers – photographer Janet Hitchen rises every morning to feed her flock of two llamas, five goats, three donkeys, six cats, and six dogs (This does not include her horses). “Why so many?” a writer asks. “Just lucky, I guess,” Janet replies.